When you mail in your saliva sample to AncestryDNA™ or another DNA collector they use a nifty device called a microarray to map your genome. They don’t look at your entire genetic code, because our genomes are by and large 99.9% the same across all humans (I bet you feel soooo special now). Instead, they focus on the 0.1% of known common genetic variation between us. These variations, also known as markers, or SNPs (“snips”), account for most of the human genetic variations you observe. They account for differences in eye color, skin pigmentation, and many other traits. “Raw DNA data” sounds like a mouthful but it’s simply a computer file that lists out these SNPs, along with other useful information which we’ll get to later. It’s a text file you can save to your desktop, or double-click to open. 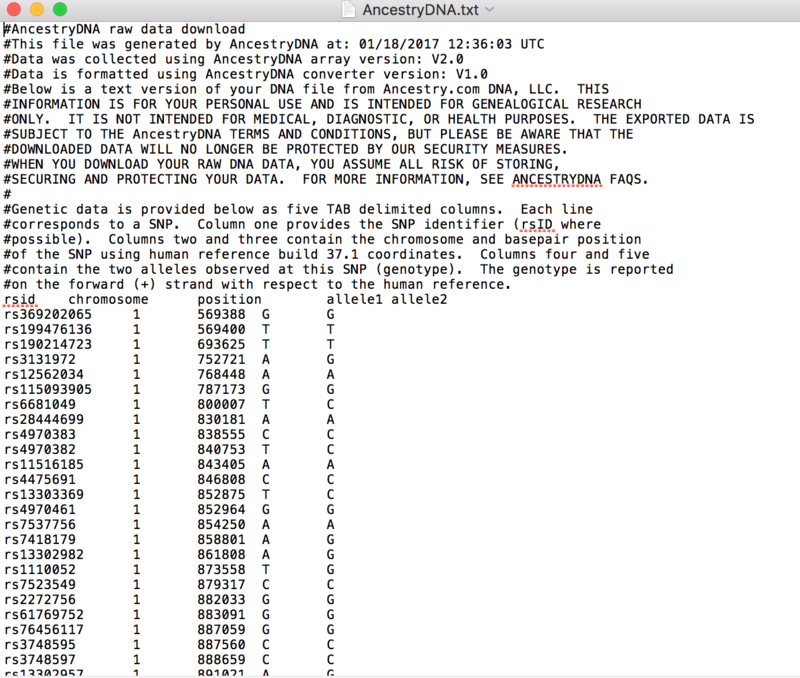 AncestryDNA™ and 23andMe provide raw data in a .txt format (compressed during download as a .zip); FTDNA provides it as a .CSV file (compressed as a .gz). DNA collectors only use a very small portion of your DNA to generate their results. The big draw of third-party tools like Gene Heritage is they give you a second chance to mine your unused raw DNA data for even more information about yourself. The difference in SNP counts between DNA collectors explains why coverage may vary with your third-party tool. Your two alleles for each SNP (one comes from your father, one from your mother). Possible allele letters are A (adenine), C (cytosine), G (guanine), T (thymine), or 0 (for missing data). 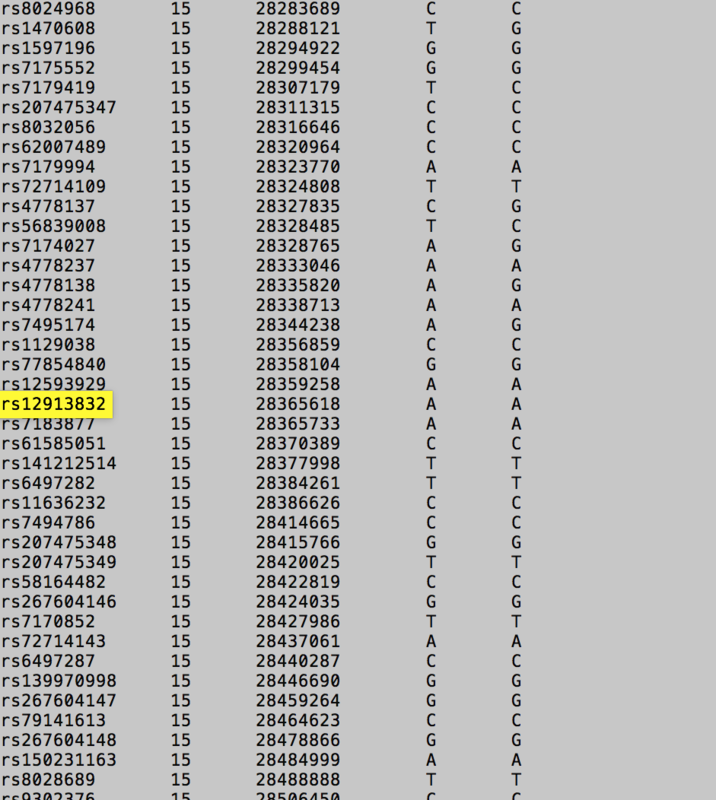 In this screenshot, the highlighted line corresponds to a variation influencing my eye color. I inherited one A allele from my mother and another A allele from my father. SNPs are each made of a pair of letters, some combination of A and/or T or C and/or G. Since you get one letter (or allele) from each other parent, the possible combinations are AA, AT, or TT. How Do I Use Raw DNA Data? Does ABCC11 Influence My Body Odor?